Home Market Intelligence	California Department of Public Health Publishes FAQ Trying to Ban Hemp-Derived CBD Oil. But What’s Really Going on in California’s Emerging CBD Market? A cloud of uncertainty is looming over California’s hemp industry. 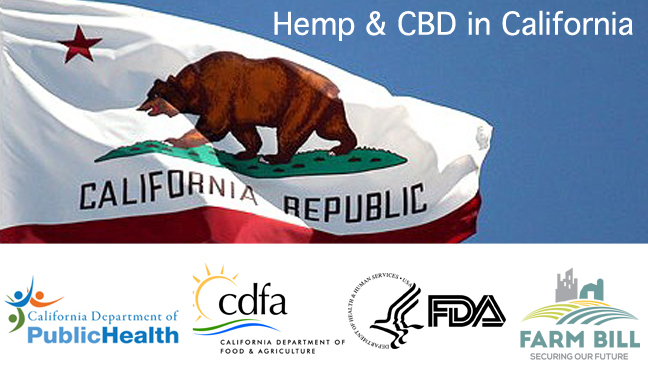 Earlier this month, the California Department of Public Health (CDPH) issued a FAQ on Industrial Hemp and Cannabidiol (CBD) in Food Products, declaring that the use of hemp-based CBD oil in food products would not be permitted in the state. Although the FAQ is legal and regulatory in nature and content, it is important to understand the economic backdrop in the U.S. CBD market. In 2017, U.S. CBD sales totaled approximately $367 million, with a little more than half coming from the hemp industry. By 2022, the market is expected to grow to approximately $1.9 billion, with sales split across three industry sectors: hemp-derived CBD products, CBD products sold in a dispensary (marijuana), and the rollout of Epidiolex, GW Pharmaceuticals’ CBD-based medicine, to the U.S. market this fall. There are three “swim lanes” for competitors within the nascent CBD market: hemp-derived CBD, marijuana-derived CBD, and pharmaceutical CBD. Yet, in the Golden State, participants are not limited to one lane. For example, Epidiolex is a plant-based pharmaceutical currently derived from marijauna growing in the UK but sold through its Carlsbad-based subsidiary Greenwhich Biosciences. Meantime, CV Sciences has a best-selling, hemp-derived nutraceutical on the market while also formulating a pharmaceutical CBD drug currently undergoing pre-clinical trials. As happens in the pool, swimmers sometimes stray from their lanes, and occasionally interfere or attempt to influence – both overtly and covertly – the progress of rivals through legal, regulatory, political, or even agricultural attacks—some cultivators have been known to cut down others’ crops to protect their grows from pollen drift. Call it a huge cannabis mess in California, though at HBJ, we recognize it as an emerging multi-billion dollar market. The response from the hemp industry about the CDPH’s FAQ has been a combination of outrage and confusion over the CDPH’s interpretation of law, with some accusing the department of trying to squeeze out hemp in favor of entrenched marijuana interests in the state, whether intentionally or through lack of awareness about established law. Additionally, the letter points out per the U.S. Drug Enforcement Administration (DEA)’s own internal and external direct that the mere presence of cannabinoids is not in and of itself indicative of whether the substance falls under the scope of the Controlled Substance Act (CSA). The reasons given by the CDPH for banning the use of hemp-based CBD oil are somewhat complicated and, to many in the industry, more than suspect. The reasoning goes something like this: Hemp-based food products and cannabis-based are not governed by the same state authority. Cannabis-based food products are governed by the CDPH’s Manufactured Cannabis Safety Branch (MCSB). Industrial hemp-based food products, on the other hand, are governed by the CDPH’s Food and Drug Branch. Therefore, the policy concerning whether CBD derived from industrial hemp is a food product falls on the CDPH Food and Drug Branch to outline. The question is quickly complicated because hemp-derived CBD in California is not only a state issue, but a federal one. The federal Agricultural Act of 2014, better known as the 2014 Farm Bill, allows for cultivation of industrial hemp under Section 7606, to establish pilot projects for research and commercial purposes through state departments of agriculture and institutions of higher education. The California Department of Food and Agriculture (CDFA) was empowered by Congress to establish a hemp pilot program in California, but the department has been painfully slow in getting its hemp program off the ground. As stated on the CDFA website, “all growers of industrial hemp for commercial purposes must register with the county agricultural commissioner prior to cultivation.” Meanwhile, however, “registration is not yet available.” Until the matter is reconciled, the catch-22 leaves hemp farmers literally at a loss. Ultimately, the controversy is due to gross misalignment between state and federal laws. In California, the marijuana industry now includes both legal medical and adult-use markets though marijuana remains a Schedule I drug pursuant to the CSA. Simply put, marijuana is fully legal at the state level, yet completely illegal at the federal level. Conversely, industrial hemp is legal at the federal level under Section 7606 of the 2014 Farm Bill, but the CDFA is so convoluted whether by bureaucracy or misinformation that at the state level farmers are unable able to register and grow hemp. Thus, current conditions in the Golden State make it easier to grow marijuana than industrial hemp. In enacting the 2014 Farm Bill, the intent of Congress – as described by 29 bipartisan members in a congressional amicus brief – was to confirm that industrial hemp, or cannabinoids derived from industrial hemp, are not to be treated as controlled substances. Contrary to the treatment of controlled substances, the Farm Bill sought rather to specifically allow for many activities relating to industrial hemp, including but not limited to certain commercial activities, developing hemp-derived CBD products, exploring the economic impact of hemp-derived cannabinoids, and creating a retail marketplace in the state. Therein lies the rub: The CDPH memo is not in line with Congressional intent. The CDPH’s questionable interpretations of law seem bound to gain more national focus as the 2018 Farm Bill moves closer to the president’s desk for signing. To further complicate matters, the U.S. Food and Drug Administration (FDA) is the federal entity tasked with regulating and enforcing food and drug laws. In its FAQ, the CDPH incorrectly asserted that CBD is an unapproved food additive or dietary ingredient, or otherwise inappropriate for inclusion in products intended for human or animal consumption as regulated by the FDA. According to Hoban Law Group, cannabinoids derived from industrial hemp are lawful. Thus, such cannabinoids cannot be deemed as an “adulterant” or an unapproved food additive or dietary ingredient by virtue of alleged illegality. There are no other sources of federal or state law which specifically classify CBD or other hemp derivatives as adulterants. At minimum, hemp-derived CBD products are pursuant to the Dietary Supplement Health and Education Act of 1994, if not also as a conventional food pursuant to the Federal Food, Drug and Cosmetic Act. Such treatment would be appropriate given the longstanding prevalence in the marketplace of products containing derivatives of industrial hemp, including various amounts of cannabinoids such as CBD. Though the memo has stoked uncertainty and fear within the hemp industry, Garrett Graff at Hoban Law Group explains that the situation may not be as problematic as it appears. It is unclear as to whether the CDPH has plans to speak with representatives from the hemp industry about the controversial policy, and the department has yet to respond to the letter sent by Hoban Law Group inviting the CDPH to engage in a dialogue with stakeholders in California’s hemp industry. HBJ reached out to the CDPH for commentary, but a response was not given by the time of publication. HBJ will keep you posted as the CBD market unfolds in the fifth-largest economy in the world. Please share this article if you found it helpful or comment below. We encourage your thoughts and feedback about any facts coming out of California and pertaining to this topic.